West Ham and Ghana forward Andre Ayew has shown he is not a man to shrink in the face of adversity. In January the 26-year-old was forced to play out of position for then-club Swansea when Francisco Guidolin took over as coach from the sacked Garry Monk. But he responded brilliantly. His positive attitude, consistently good performances and goals played a part in helping the Swans stave off relegation from the Premier League. Ayew scored two crucial goals in a 3-1 win over Liverpool to help earn a result which finally confirmed Swansea's safety after a nerve-racking 2015-2016 campaign. In total Ayew notched 12 goals in 35 appearances and his impact was recognised when he was named the newcomer of the year at the club's end-of-season awards. 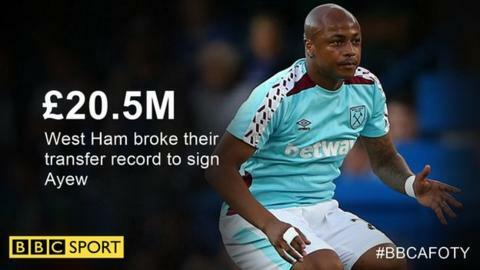 His form was so impressive that, in August, the Hammers broke their transfer record to bring Ayew to east London at a cost of £20.5m. Ayew was then seriously injured on his league debut, but after a two-month absence he returned to action at the end of October. And it is "the hunger in Ayew's eyes", as seen by former Ghana international Yaw Preko when they first played together, that could drive Ayew on to show his worth this coming season. In international football, Ayew continued to be Ghana's main man in 2016. He was on the scoresheet and put in a man-of-the-match performance in the 2-0 win over Mauritius which booked the Black Stars a place at next year's Africa Cup of Nations in Gabon. Ayew has been used to dealing with the pressure and expectation that comes with being the son of Ghana legend Abedi Pele Ayew, who is widely rated as one of the finest African players of all time. Ayew senior played 73 times and scored 33 goals for the Black Stars and helped them win the 1982 Nations Cup and finish runners-up in 1992. He also won the 1993 European Champions League with Marseille, having lost in the final of the European Cup two years earlier. Ahmed Brynes, a coach at Ghanaian side Nania FC where Ayew first began to follow in his father's footsteps, has made a fascinating prediction. "When Ayew was only about 14, he was already performing magic and he was even saying 'I want to be better than my father'," Byrnes told BBC Sport. "I told him, 'look, your father has just raised the bar too high for you'... but he replied 'I will overcome it' and I believe with time he's going to overcome it." Abedi Pele Ayew was named BBC African Footballer of the Year in 1992. Ayew junior emulated that feat in 2011 - could this be the year he surpasses it?